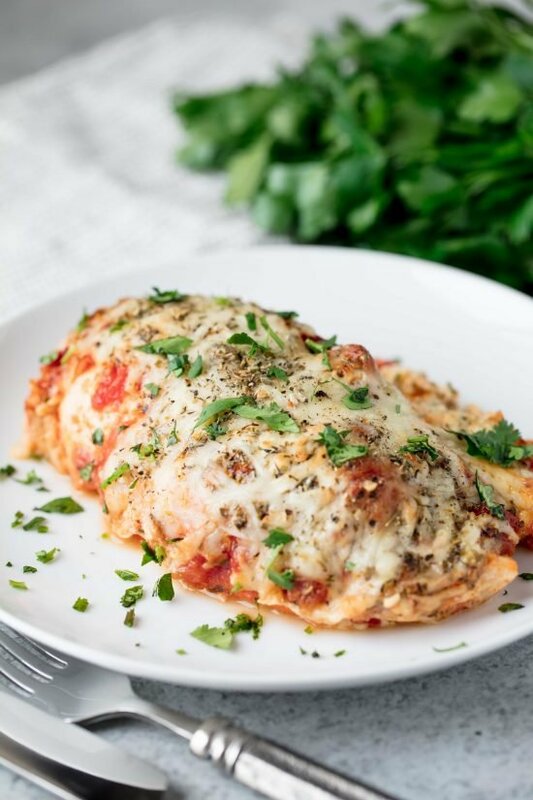 Lasagna Stuffed Chicken is all the flavors you love from lasagna stuffed inside a chicken breast and it's smothered in cheesy, saucy goodness. What's not to love? Butterfly chicken breasts and place into a lightly greased baking dish. In a small mixing bowl, stir together ricotta cheese, egg, 2 teaspoons Italian seasoning, garlic, salt, and 1 cup mozzarella cheese. Spoon about ¼ cup of sauce onto one half of each chicken breast. Spread ricotta mixture on top of the sauce and fold chicken breasts over to close. Drizzle remaining marinara sauce over chicken. Top with remaining mozzarella cheese. Sprinkle with remaining Italian seasoning and season with salt and pepper. Bake in a 400 degree oven for 25-30 minutes, until chicken reaches an internal temperature of 165 degrees F.